Elaine Adair Pieces: We're supposed to clean these machines? We're supposed to clean these machines? 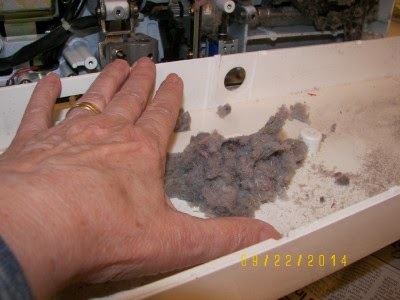 The bottom of my Janome 6500 can be easily opened up for occasional cleaning, by removing 5 screws. The last time I cleaned it was ... uhhh, over 5 years! (I DO clean the bobbin regularly.) This job was necessary because my always reliable machine was not machine quilting well. Despite all the internet help, friend help, manual help, etc., it still was skipping stitches. Off to the sewing machine hospital. Is this not terrible???? I have probably quilted 15 or more quilts in the last 5 years. I vacuumed it with the big, household vacuum cleaner, then blew it with canned air and it dislodged several clumps, that were like felt pads. Wow - who knew??? It normally sits IN a sewing desk - taking it out like this is not a small job. I promise to do it more frequently. I have a 6500. Do you just unscrew those 5 screws on the bottom and they go right back on? Oh my!! I've never cleaned the bottom of my Bernina :-( I wonder if I can get into it! Must go check the Bernina site to see if I can open the bottom of mine . . . I used to have a Janome 6500, just like yours. Some years ago you showed on your blog how to clean it, which I did. Thanks! Now I have a Janome 7700, a Horizon with an 11" throat--a very nice machine. Only it's impossible to remove the bottom to clean. It just means it has to be taken in to the dealer once a year for him to take care of. Too bad, but our machines are well worth taking good care of! 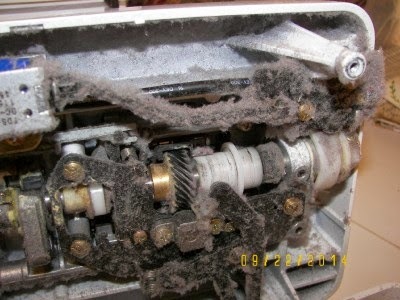 Hmmmm, I wonder what the inside bottoms of my machines look like. Not even sure if I can get them open. 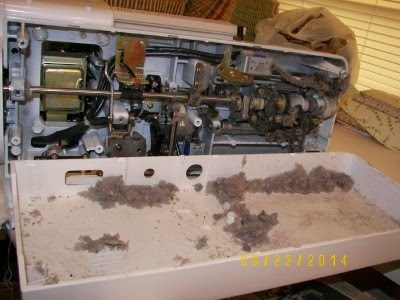 I have this wonderful machine too and found the mess when I went in. I thought a pin had fallen through a hole. Well that would be 24 pins. Just saying though if it has been five yrs. you need to go in and let them adjust your timing. I did such and my machine is sewing like the first day I had it. I quilt for others and myself and mine had a workout and needed an adjustment. Computerized machines like the TLC. I had thread dust and pins. Got a dab of tape over the hole now.